Get feedback from other people. Be kind to yourself. Try to be truly objective about your performance, which means finding both good and bad aspects. Don't concentrate only on your weaknesses; keep remembering your strengths. Don't try to solve too many problems at one time. Remember that there are major and minor problems. For example, holding a marker during an entire presentation is a minor problem and easily corrected, whereas having too much information in your presentation is major and may take some work to fix. Work to correct one delivery technique at a time. For example, if you say "uh" a lot, get rid of that habit before working on others. Practice self-evaluation regularly; realize it is an ongoing process. Prioritize the things that are really wrong. Focus on the six major speaking faults and the trouble spots. Don't ask your most critical colleagues to criticize you (nor your most supportive). Build yourself up by thinking of how much you have improved. Listen to that feedback; if someone compliments you, believe it. That's how self-confidence and positive energy develop. The only way to grow as a speaker is to keep coaching yourself. Professionals use coaches because excellence is a process; you learn as you go along, you learn from your experience. Because coaching pinpoints both strengths and weaknesses, professional speakers find coaching to be a very important part of the path to speaking with power. You learn powerful public speaking by having to speak; you also learn it by listening carefully to others. Use the form on page 259 when you hear people speak, and it will help you quickly pinpoint common strengths and weaknesses. 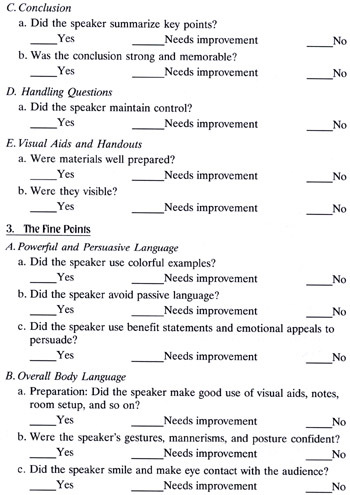 You can also adapt it for use as a handout after you speak. 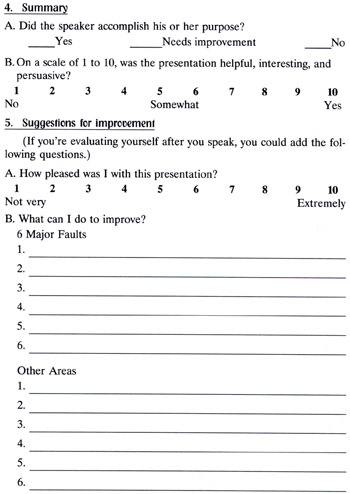 Watch a well-known preacher on television and use a speaker evaluation form to critique him or her. Make a five-minute motivational talk at your next staff meeting. 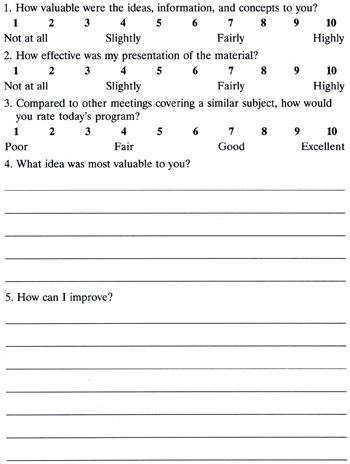 Pass out evaluation forms after the presentation. Then make a list of the major and minor points you need to improve and an action plan for how you are going to do it. 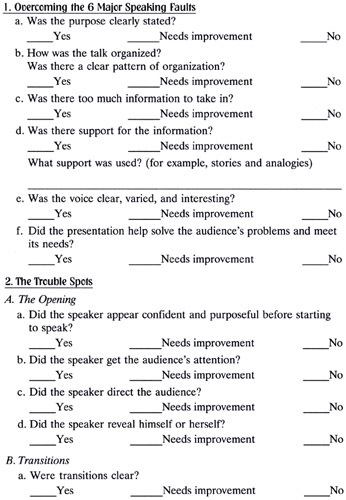 You can use this form with a variety of audiences to get feedback about your presentations. Vary it according to the type of presentation.